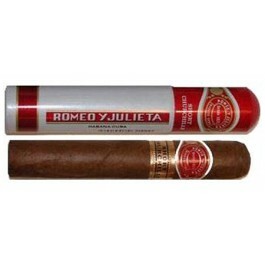 The Romeo y Julieta Short Churchill is a generous medium robusto, with 50 ring gauge, 4.9” (124mm) long and comes in aluminum tubes in a box of 15 cigars. This vitola develops typical Cuban aromas, rich wood, earth, leather and some hints of fruits and chocolate. It is a cigar that can both appeal to aficionados of mellow cigars and to novice smokers. Released in 2006.